New Toys Not Played With…Now What? It seemed like every year Christmas would come, I would go out, search for toys and find some that I thought would be fabulous for Andrew. I tended to choose pretty basic things that had lots of possibility in my mind to build his pretend play skills. He would open the toys and they would get set aside with all of his attention turned to the toys with on/off switches, music and lights. My choices couldn’t compete but that was fine, I figured we had a whole week in the house together. During this break from school, I would ask him if he wanted to play with a certain toy and his response was “No!” (if I got any response at all). And so these toys sat…and sat…until I came to a realization, one that made a huge difference for me and perhaps can help you as well. One day it occurred to me that perhaps the reason he has no interest in these toys is that he has no idea how to play with them. Most children learn how to play with their toys by having someone playing with them, acting as the model for how to play. This works great except for those of us with children who don’t want to play with us. Since this was not an unfamiliar concept with us, I began to think, “Was there a way to incorporate some of these toys into an Obstacle Course so I could teach him how to play with them?” You bet! Now, in all honesty, I had to make some mental shifts because what we would be doing was different from the ideal in my head when I purchased the toys. We were not going to be sitting for hours in the afternoon while we built carnival rides with “Magformers” but that was okay. My goal shifted from getting him to play how I had envisioned to teaching him the basics of the toys he had so that maybe down the road he would use that knowledge to play on his own. When I begin to work on a skill in My Obstacle Courses, I break it down to the most basic point that I know he can handle so I can build from there. Teaching him how to play with these toys would be no different. 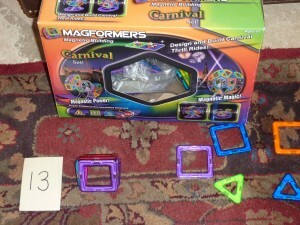 I had to look at these toys and think about the basics- what does he need to know how to do to put one part together? Does he need a model? Does he need written out directions giving him what to do step by step? I incorporated these ideas with an activity we had done before as an Obstacle Course station, “Make the Same” (click here to get more details and pictures of this) and it worked! He got the exposure to the toys, their different parts and how to put them together so that down the road he would be able to build on those skills. He had a model in front of him, the pieces he needed to make his own and me to help him when he got stuck. I encourage you to look around for toys around your house that your child does not play with and see if you can break them down to be something very basic to build a play skill that could fill in a blank, one that may be preventing them from playing with something they actually want to play with!